Anicca Digital was proud to play a part in an innovative public/ private partnership to train the marketers of the future how to respond to a live marketing brief. The agency was one of a number of partners in the project including Midlands-based luxury car brand Aston Martin, De Montfort University and Bulb Studios, a Leicester-based web development and design company. 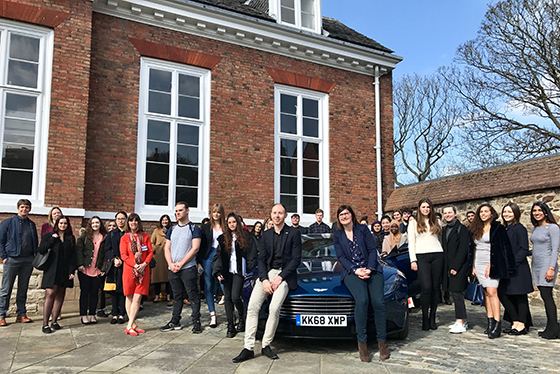 The project was the brainchild of senior lecturer Rachael Mabe and featured a live brief being set to market Aston Martin as a brand to either a new target market or through its involvement in Formula One. The challenge was taken up by a large number of students on second year marketing courses, with the seven top teams selected to present to a panel of judges, including DMU alumnus Craig Neale, now senior content and social media manager at Aston Martin, Mat Mabe of Bulb Studios and Caroline Spence of Anicca Digital. The winning team produced a great campaign based on introducing Aston Martin to female drivers in Saudi Arabia. “The presentations were way beyond anything I expected,” said Craig Neale, who added a wow factor by bringing an Aston Martin car to the presentations at DMU. “For a luxury brand, you’d expect high levels of professionalism and an element of mystique to the presentations, so it was interesting to see how they met the brief. “I was impressed with the thought and recognition of how we use social media and their approach. Caroline Spence has previously delivered lectures on Influencer Marketing and PR to the marketing students to enable them to respond to the brief. For more information on Anicca’s Influencer services please visit our website here.